A secretive bunch, Gubs hide from danger within hollow tree stumps and forest underbrush. They are a peaceful folk. They spend their days building up cities of mushroom homes and traveling about upon Velvet Moths or Toads in search of valuable Lure treasures. But their world is full of hazards, each more deadly than the last, and only cleverness and luck can see them through. This is the ongoing struggle of the Gubs. The Gubs card game is a game of wit and luck. With a single Gubs deck, up to 6 players of ages 10 and up can enjoy a fast-paced, hilarious game filled with all sorts of creative card combos. To win, you must be the player with the most Gubs when the game ends. Easy to learn and to play, Gubs is an amazingly replayable game with new strategies just waiting to be discovered! I picked up Gubs on a whim, from the manufacturers review it sounded quite quirky and i thought it might appeal to my children (11 and 7). 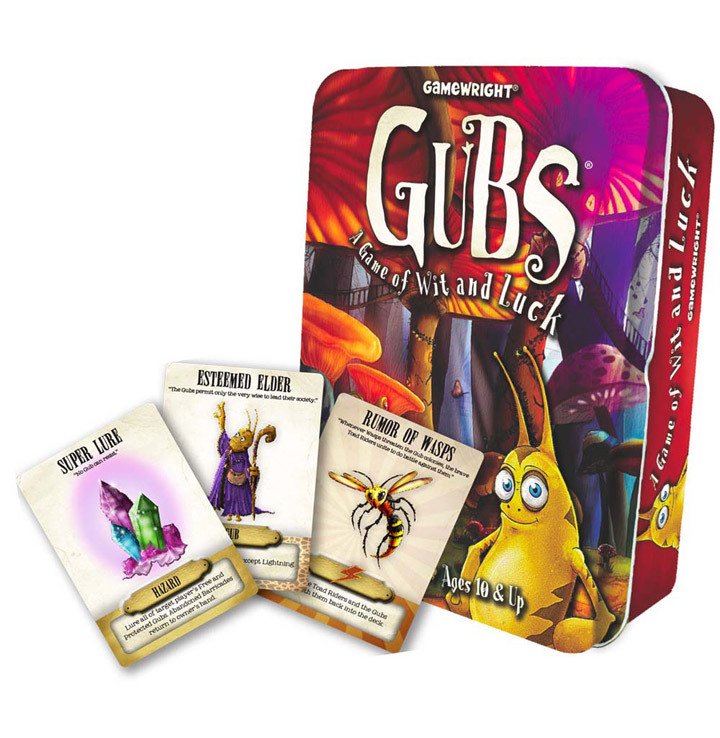 Gubs is a simple card game, within ten minutes of start you’ll be playing seamlessly, only occasionally referring to the rule sheet for more detailed effects of certain cards. The game is simple, take a card, play as many as you like and then play moves on. The effects of each card is normally written on the card and theres a lovely mix of cards of effects to keep gameplay varied. I particularly like the game length mechanic where once all three letters of GUB have been drawn thats it! Keeps games short and you guessing as to when that final B will be drawn. The game seesaws around with one players lead quickly ruined by a random event or opponents card combo. For families i fully recommend it. 1) The end of the game comes unexpectedly. The game ends when the three cards that spell G-U-B have been drawn from the deck. So, the game can end at any moment. This adds an element of surprise to the game and makes it more suspenseful. 2) This game encourages being evil. Often in friendly, family games, players hesitate to attack other players, but in GUBS so many of the cards have devastating effects that you can’t really avoid it. This turns the game into a combative free-for-all, which is a lot of fun and encourages that “just one more game” feeling, because you always want to get back at the person who just stole/killed your GUBS in the previous game. Cons: Strategy lacks depth, game is often decided by chance, some cards are massively overpowered, some card explanations are vague or don’t match the instructions. Gubs is a game set in a beautiful, colorful fantastic world. The cards are top notch. You’ll be hard pressed to find a more lovely card game for the price. Gubs is ridiculously random, sometimes fair, but most often unfair. The balancing factor is that the game equally distributes the punches and whirlwinds around the table. The goal of the game is to have the most Gubs in front of you at the end of the game. The game ends somewhat predictably after all three letter cards are played to spell G-U-B. Each turn, you play cards that let you steal Gubs, kill gubs, trap gubs, and protect gubs, among other things. However, many times you’ll draw powerful Event cards that set the entire game on its head. This is a delightful game for children or a group of friends at the park during a barbecue. It’s a game we’ve brought out time and time again because it’s so travel friendly, plays quickly, is easy to teach, and makes everyone laugh. You may not win, but you’ll have fun. This is a pretty fun game to play with my two sons. It definitely not any where near a euro game. It’s a ‘take that’ game, but it does have some strategy and there are a lot of things built into the game to prevent card hoarding and issues with run away leaders. It’s nature is more tactical than anything. Still, I enjoy it. It does teach the kids some basic logic skills and it could definitely used as a spring board to more complex card games. This is not something I would bring out with my regular gaming group, but definitely a fun one for the family. Add a Review for "Gubs"